A stocked perennial garden can use soft or powerful color combinations and if you love to be daring in your color schemes, you might amaze yourself at what you can create. But the beautiful combination to any perennial garden is that the following spring/summer/fall, you know the beauty of your perennials will reappear. And so it has been with the 26 days of kindness. It is a continuum; one gift of kindness is planted and it continues to reappear. Just like our perennials - with each season producing more blossoms, structure and beauty. That may seem like a basic 101 of perennials to avid gardeners but many of us still love annuals and opt out of adding more depth with our perennial beds. We might even forget that our perennials are the true workhorse and backbone to our garden beauty. Plus, it’s a return on your garden investment when they come back year after year. But now it’s time to officially kick off day 3 of 26 days of kindness. Today, we honor Olivia Engel. Her family has said she loves pink and purple, dancing, art and had a great sense of humor. If you are just jumping on board, here is the event page or the FB Page to join, post or just view. 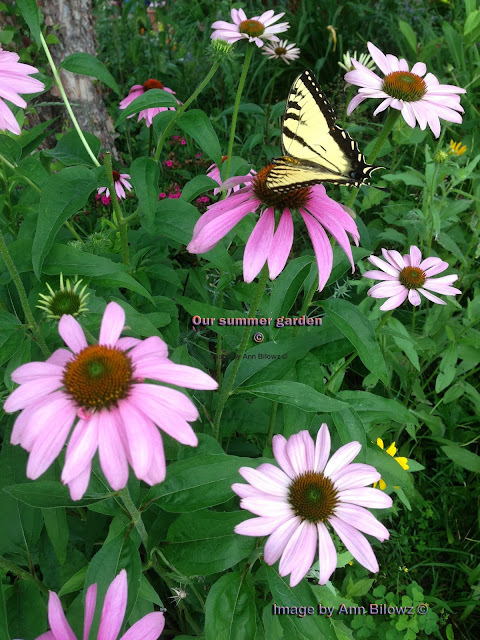 For today's image, I chose one from the summer archives of a butterfly floating on the purple coneflowers. This morning, there wasn’t a perfect person that immediately came to mind to be the recipient of this 3rd day of kindness. I believe today’s might be dancing in the sunlight like the butterfly, an opportunity to celebrate and honor Olivia with a gift of needed kindness, that like this butterfly just appears. As Steve Maraboli reminds me on this third day of kindness, “Sometimes it's the same moments that take your breath away that breathe purpose and love back into your life.” A random act of kindness is as simple as that.